MILLEDGEVILLE, Ga. – Widener University’s Ryan O’Hara (Royersford, Pa.) and Blaine Price (Jefferson, Md.) 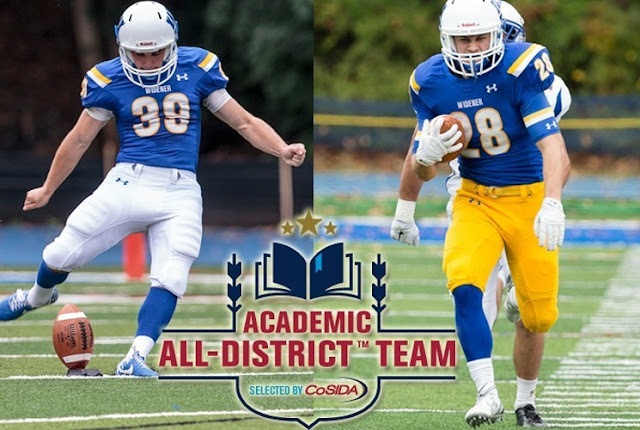 have been named to the Capital One District IV Academic All-All-America Football Team, as announced by CoSIDA (College Sports Information Directors of America) on Thursday afternoon. Both players were chosen to the all-district first team and are now eligible for Academic All-America laurels. O’Hara, a senior kicker and accounting major, is being recognized with the award for the second straight season. He currently ranks third nationally and first in the league in field goals per game (1.63) this season and has drilled at least two field goals in five of the eight games. O’Hara has also been recognized as the Middle Atlantic Conference Special Teams Player of the Week this year and was honorably mentioned for All-MAC accolades in 2014. Furthermore, the senior has been named a 2014 Academic All-MAC selection and has been placed on the MAC Academic Honor Roll. Price, a junior biomedical engineering major, has been one of the league’s top receivers this season. He enters this weekend’s action ranked second in the league in reception yards per game (93.2) and receptions per game (7.3). In addition, Price has racked up at least 100 receiving yards in three of the six games he has appeared in and reached paydirt five times in four different contests. Widener (5-3) returns to Leslie C. Quick Stadium for the final time during the regular season when it hosts FDU-Florham on Saturday, Nov. 7 at 1:00 p.m.